This week the editing of mini films continues; below, Jack works away on his edit. The filming almost complete, Jim shows some of the group how to edit their material. Do you think these two have just found a way to avoid the rain?! As Callum skips away for a detail in his film, you can see the film crew working well together. The film crew also interviewed Zelfa Barrett – a professional boxer in the Super Feather Weight category- again another excellent example of the crew working well together. A big thank you to Lyndon (and his family!) for allowing us to film ‘on location’ in his bedroom. Here’s Thomas looking very at home on the X Box. Luckily you can see the film crew squeezed into the corner on the left hand side, so he is working really. Each film incorporated drama combined with documentary footage and narration. The lads had to think about images and audio as separate elements, and work out how they wanted to mix these elements together. We learnt how to use the sound recorder and boom mike. It’s one of those jobs you need 3 hands for! 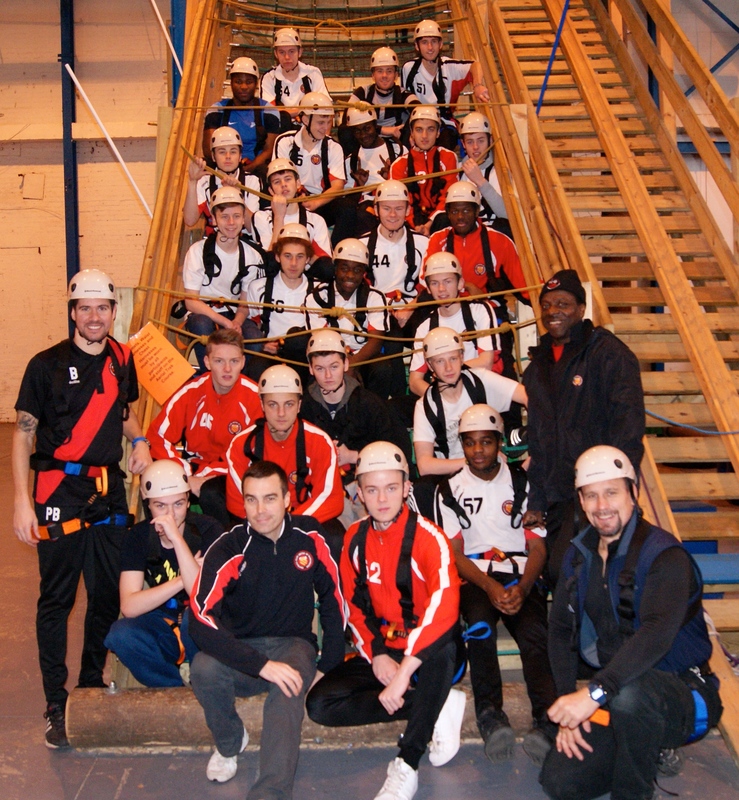 The boxers joined with the footballers to attend a team building session at ‘C hallenge for Change’ It’s very physical and involves climbing high and rope walking , its all about getting over obstacles by working together. A good time was had by all. This session, the lads learnt about the roles and responsibilities of each member of a film crew and practiced: the Camera Operator, Director, Sound Operator and Clapper. Clear communication was essential and the boxers picked it up very well. As well as moving image, we started looking at portraiture, encouraging the lads to think about how they want to be represented and to think about what their association with the gym says about them. This is Jack’s portrait, he had identified words such as pride, discipline and self respect. I think he has successfully caught these elements within this portrait.